Try my workout of the day. Do as many rounds as possible in 20 minutes. Dude, it's almost lunch up in this piece. I'm about to do the toes to bar part for a while this evening. Seriously, I will try the workout, as long as the handstand push ups can be done against a wall at first. Of course. I actually hang a loop of rope, wrap my feet in it and use that to stabilize and add a little help when needed. Today I am doing the Crossfit WOD. Its on their homepage if you want to check it out. EZ, try not to make you whole day about lunch! There are other meals too. I like to call Dinner "evening lunch"
That's just dumb. Sorry. Find a better name and maybe I'll get onboard. The crossfit WOD was silly today. I almost died today doing it. By round 6 I was doing like 5 reps and then breaking. Silly. Yo, EZ, you must get the gnarliest post-lunch chills ever! Today is more traditional weight training. Don't have the intensity for a crossfit one today after playing hockey the last three nights in a row. I don't know about that. I have learned through thru years how to train so that I don't over train and I don't sit still too long either. Balance is key, right? Totsally key. Anytime I feel I'm stagnant it gets to me...bad. Took me 24:10 ...I'm still wiped. I modified it down to 35 reps for each because of my energy level and soreness. I know, sissy right? Tuesday I did weight training for Biceps ,Triceps and Abs. Tonight I have hockey so today is a rest day. I do find as I cross into my senior years that low rep, heavy weights are the ticket. Helps me with strength, mobility, and I believe, other things like weight control, and even cutting down on cold viruses - virtually none during the last two or three years. But key is to avoid injury, because every one takes months to heal. I do 5 sets at 5 reps three times a week: 235 lb back squat, 275 lb dead lift (5 singles), 145 bench and 125 OH press. If form is good, no injuries. I also do tree ascensions, of course. Pic of my home gym. Nice gym Mick! Tough routine too. You have an old shoulder injury or something? Bench is out of line with the other disciplines no? Marlin, is that your routine or from a gym you go to? I was the proverbial 98 pound weakling. Discovered weights at age 60. I guess I have no pecs or triceps to get beyond 145 bench. I heard that 245 is required for NFL players. I go to a cross fit gym 3 or 4 days a week but on weekends do wods that require no equipment. 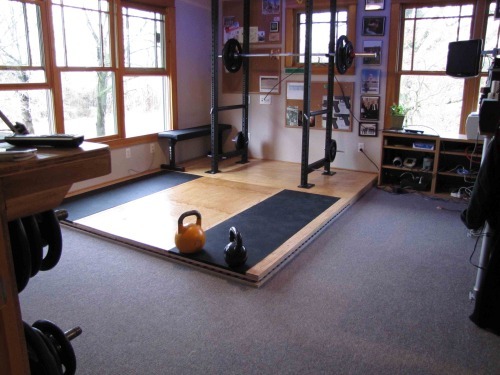 Im working on building a gym in my garage. Rogue fitness has some really nice stuff.